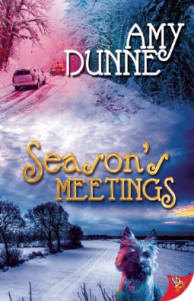 Catherine Birch is unhappily conned into spending Christmas with her best friend’s family in the Scottish Highlands. When she misses her flight, Catherine is forced to road trip with Holly Daniels. The two could not be more opposite. And when a raging snowstorm leaves them stranded, Catherine and Holly are left not only fighting each other but their escalating attraction. I was a little late reading this story. Not that it’s old (the book was published in Dec. 2014), but it would have been the perfect to tale to read around Christmas. Season’s Meetings is a glowing romance with the necessary drama to forward the plot. A brand new 4 star review of Season’s Meetings.